CH290 Comfort Classic Deluxe Drafting Chairs. Ergonomically designed for long-lasting service and extra comfort. 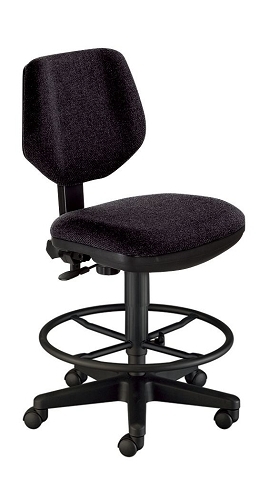 These chairs feature a gas lift mechanism that instantly adjusts seat height from 17 1/2" to 22 1/2". Handwheel adjustable backrest provides spring action lumbar support. Extra-large seat is contoured and cushioned for added comfort. Upholstery fabric comes in navy blue, black and medium gray. Frame is constructed of sturdy metal with black finish and is supported by a 5-star 24" span metal base with double wheel, locking, hooded casters. Full 2-year warranty on all metal parts. Includes 22" diameter footring that can be adjusted to the desired height and then locked into position. 148 points will be rewarded when you are logged in to your account and buy this item.